This article is about the film. For the franchise as a whole and other uses, see Honey, I Shrunk the Kids (disambiguation). Honey, I Shrunk the Kids is a 1989 American comic science fiction film. The directorial debut of Joe Johnston and produced by Walt Disney Pictures, it tells the story of an inventor who accidentally shrinks his and his next door neighbor's kids to a quarter of an inch with his electromagnetic shrinking machine and accidentally throws them out with the trash, where they must venture into their backyard to return home while fending off insects and other obstacles. Rick Moranis stars as Wayne Szalinski, the inventor who accidentally shrinks his kids, Amy (Amy O'Neill) and Nick (Robert Oliveri). Marcia Strassman portrays his wife, Diane, to whom he delivers the titular line. Matt Frewer, Kristine Sutherland, Thomas Wilson Brown, and Jared Rushton star as Russ, Mae, Russ Jr., and Ron Thompson, the Szalinskis' next door neighbors. The film became a sleeper hit upon release. An unexpected box office success, it grossed $222 million worldwide, and became the highest-grossing live-action Disney film ever, a record it held for five years. It was met with positive reviews from both critics and audiences, who praised the story, visuals and innovation. Its success spawned two sequels Honey, I Blew Up the Kid in 1992 and the direct-to-video Honey, We Shrunk Ourselves in 1997, which both received mixed critical reception, as well as leading to the creation of a TV show that ran from 1997 to 2000. Scientist and inventor Wayne Szalinski lives in his suburban home at Fresno, California attempting to perfect a ray gun capable of shrinking objects, but it keeps blowing up the apples he uses as test subjects instead. He argues with his wife, Diane, and worries about their daughter, Amy, and son, Nick, who has inherited Wayne's inventive ingenuity and intelligence. Their next door neighbors, the Thompsons, are getting ready for a fishing trip, but their oldest son, Russ Jr., is less than enthusiastic, as his and Russ' interests often clash, resulting in him feeling belittled, and he is more interested in meeting Amy than spending the weekend camping. Their younger son, Ron, however, is enthusiastic, though his relationship with Russ is strained when he inadvertently sets off a booby trap in the yard. Wayne instructs Amy and Nick to clean the house before leaving for a conference. Nick is assigned to mow the lawn, but he makes a deal to let his friend, Tommy Pervis, do it with the remote-controlled lawnmower, but the latter has to leave and promises to do it later. Later, Ron accidentally hits his baseball through the Szalinskis' attic window, which inadvertently activates the machine and blocks its targeting laser. Caught by Russ Jr., he is made to confess to Amy and Nick, and Amy has Nick take Ron to retrieve the ball and pay for the window. They come upon the machine and are hit by its beam, thus shrinking them. At his conference, Wayne is laughed at for failing to provide proof of his shrinking machine and leaves in frustration, while back at home Amy and Russ Jr. go to check on Ron and Nick and are shrunk by the ray as well. When Wayne returns home, they try to get his attention, but their voices are too small and he is unable to hear them. Frustrated by his day and the broken window he discovers, he takes it out on the machine, damaging it and nearly crushing the kids with the fragments. He then sweeps the debris (and the kids) into a dust pan and takes them out in a trash bag. They escape from it, but are forced to cross the uncut yard's wilderness to get back to the house. Meanwhile, Diane returns home and she and Wayne make up, but they soon grow concerned about Amy and Nick. While trying to summon their dog, Quark, Nick falls into a flower, he and Russ Jr. are carried away by a pollen picking worker bee, and are nearly killed by Wayne as he tries to swat it with a baseball bat, causing it to crash land. Wayne realizes that a baseball was what caused the attic window to break since Nick doesn't play sports. Investigating, he realizes what happened to the kids; afraid to step on the lawn, he uses stilts to search for them and accidentally activates the sprinklers, which causes chaotic torrents to come down on them. Amy nearly drowns when she is knocked into a pool of mud, but Russ Jr. saves her with mouth-to-mouth resuscitation. Meanwhile, Wayne arranges a sling to hover over the lawn and search for the kids. Next door, Russ and Mae are forced to call off their trip because their sons haven't returned yet, and they call the police to report them missing. Wayne tells Diane about what happened to the kids, and she joins in the search after a short panic attack. Eventually, she convinces Wayne to tell Russ and Mae, who are extremely skeptical. Russ angrily threatens Wayne, but leaves his porch light on just in case. Soon, the kids' hunger is saved by one of Nick's oatmeal creme cookies, but their meal is interrupted by an ant scouting it. Ron decides to tame it in order to take them home. Soon they grow attached to "Antie" and try to set him free, but he instead decides to follow Ron like a loyal pet. The kids find a Lego to camp in for the night, and after a heartfelt conversation about their feelings for each other, Russ Jr. and Amy kiss. However, they are attacked by a scorpion, which traps Ron in the Lego. Antie comes to rescue Ron, but is fatally stung before the kids unite and wound the scorpion, driving it off. The next morning, Tommy returns to mow the lawn. Nick recognizes the danger and they run, seeking shelter in an earthworm burrow; Wayne and Diane stop Tommy just in time to save the kids, who are blown out of the burrow by the lawnmower's blades. Quark chances upon them, and while riding him into the house, Nick loses his grip and falls into Wayne's bowl of Cheerios; he is nearly eaten before Quark bites Wayne in the ankle, making him aware of Nick and the others' presence. Back in the attic, the kids make Wayne realize that the laser was generating too much heat, causing things to blow up, until it was blocked by the baseball. He corrects the mistake, and Russ volunteers as a subject for a successful test. The kids are then returned to their normal sizes and reunited with their parents. Months later, at Thanksgiving, the Szalinskis and Thompsons, now close friends, are toasting over an enlarged turkey. Russ Jr. and Amy are apparently dating now, while Ron and Nick are friends, and Quark is eating from an enlarged Alpo bone. Nick finally gets a joke that Russ Jr. told him about learning CPR in "French" class, at which he laughs. Matt Frewer as Russell "Russ" Thompson, Sr.
Thomas Wilson Brown as Russell "Russ" Thompson, Jr. The project was originally brought to Disney Studios by Stuart Gordon and Brian Yuzna. Gordon was hired to direct the film and Yuzna to produce. The film was written as Teeny Weenies by Stuart Gordon, Ed Naha, and Brian Yuzna. Tom Schulman was later added as a screenwriter. Gordon originally prepped the film but had to drop out as director shortly before filming began due to illness. Joe Johnston was brought in to replace him. As Teeny Weenies seemed to appeal more to a child demographic, the name was changed to Grounded to appeal to a more mature audience. That name was later rejected in favour of The Big Backyard. Honey, I Shrunk the Kids, a line of dialogue from the film, ultimately became its title. The film was heavily influenced by '50s fare such as The Incredible Shrinking Man. Judy Taylor, Mike Fenton, and Lynda Gordon were the casting directors. Before Rick Moranis was cast as Wayne Szalinski, the script was written with Chevy Chase in mind because of his popularity in National Lampoon's Vacation. He was filming the second sequel, National Lampoon's Christmas Vacation, and was too busy to portray Wayne. John Candy was also considered for the role of Wayne. He declined, but suggested to director Joe Johnston that his friend, (and costar of SCTV, Little Shop of Horrors and Spaceballs), Rick Moranis, would be a good choice. Marcia Strassman portrays Wayne's wife, Diane, who is having marital troubles with him. Matt Frewer and Kristine Sutherland portray Russ and Mae Thompson, the Szalinskis' next door neighbors and parents of Russ Jr. and Ron. Russ is very demanding of Russ Jr. and can't understand why he isn't more interested in masculine things such as football and fishing (until the end of the film, when he learns to accept him for who he is). He is dimwitted and clumsy and secretly takes to cigarettes when he is nervous or scared. On the other hand, Mae is a very nice person and friendly with the Szalinskis. The film needed four teenagers to play the leads. Russ Jr., portrayed by Thomas Wilson Brown seems to be interested in Amy, and less in football, while Ron, Jared Rushton, appears to be more straightforward and a bully toward Nick, though he warms towards him. Rushton has quoted that he took the role after thinking that the script was "appealing" and he thought his character had progressed throughout the film with his personality. Amy O'Neill and Robert Oliveri were cast as Amy and Nick Szalinski, Wayne and Diane's kids. Oliveri commented that he was in awe about watching his stunt double do his stunts. He later starred as Kevin Boggs in Tim Burton's Edward Scissorhands. O'Neill thought the film was a fun experience and that doing off-set activities, such as swimming or playing cards, was fun to do with the other younger cast members. She accepted the role because it was a "Disney movie". Joe Johnston was selected to direct the film for his directorial debut, having been mostly working on films as an effects illustrator and art director. It was filmed at the backlot of Churubusco Studios in Mexico City. Gregg Fonseca was the production designer and was in charge of managing several different sets for the scenes in it. Some filming took place in and around Beverly Hills, California. In the scene where Diane walks out of the mall to the pay phone, a sign says "Beverly Hills Mall". It is unclear if the whole film takes place there or just that scene, as this contradicts one assertion in the sequel that Wayne was originally from, and thus the Szalinski residence depicted in this one is in Fresno. Special effects were heavily used for the film, such as the electronically controlled ants and bees. For the most part, the production team tried to use practical effects that would work in camera. For the scene where Wayne lands in the Thompsons' pool, Moranis jumped off a flying board in the form of a teeter-totter on a swing set. A stuntman pushed the board, sending him flying through the air and landing on a mat. Numerous storyboards were used for the film, particularly in the sprinkler and bee scenes. Scale models were also used for the bee scene, with miniature Russ Jr. and Nick plastic figures attached. Forced perspective was used in the giant cookie scene, to make it seem bigger. The child actors were strapped in for the scene with the broom. The bristles were actually pieces of foam that were carved and tied to a rig system. The film opened on June 23, 1989, in 1,498 theatres. It opened at #2 on opening night, behind Batman, with a total of $14,262,961. It earned $130,724,172 domestic and $92,000,000 overseas, earning a grand total of $222,724,172. Attached to it was Disney and Amblin Entertainment's first Roger Rabbit short, Tummy Trouble, executively produced by Steven Spielberg, produced by Don Hahn, directed by Rob Minkoff, and also composed by James Horner. The film has earned a 75% "fresh" rating at Rotten Tomatoes based on 32 reviews. Caryn James, of The New York Times, gave a positive review, saying: "As sweet, funny, and straightforward as its title." Variety gave another positive review stating, "[It's] in the best tradition of Disney -- and even better than that, because it is not so juvenile that adults won't be thoroughly entertained." A rare negative review came from Roger Ebert, of the Chicago Sun Times, who stated: "The special effects are all there, nicely in place, and the production values are sound, but the movie is dead in the water." James Horner won an ASCAP Award for Top Box Office Films and was also nominated for a Saturn Award. The film was also nominated for a Saturn Award for Best Science Fiction Film. Thomas Wilson Brown, Jared Rushton, Robert Oliveri and the Special Effects Crew were also nominated for a Saturn Award. The Special Effects Crew won a BAFTA Award for Best Special Visual Effects. Amy O'Neill and Jared Rushton were each nominated for a Young Artist Award and director Joe Johnston was nominated for a Fantasporto Award. The film was presented in the 100 Greatest Family Films, in which Amy O'Neill and Thomas Wilson Brown talked about it for MTV. After years without releasing James Horner's soundtrack to the film, Intrada Records released it on March 6, 2009. The song that Amy dances to in the kitchen is "Turn It Up" by Nick Kamen, written by Jeffrey Pescetto and Patrick DeRemer. The soundtrack was limited to a 3,000 copies release. Horner's main title music incorporates cues from the score by Nino Rota from Federico Fellini's film Amarcord (1973) and Raymond Scott’s piece "Powerhouse B" (1937), the latter often referenced in Carl Stalling’s Warner Bros. cartoon scores. Scott's piece was used without payment or credit, leading his estate to threaten legal action against Disney. Disney paid an undisclosed sum in an out-of-court settlement and changed the film's cue sheets to credit Scott. Horner’s main title music underscores all the major moments involving Szalinski’s technology. With 15 tracks, Horner produced the record with longtime engineer Simon Rhodes while it was originally performed by the London Symphony Orchestra. 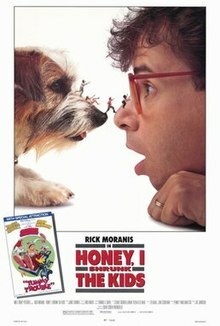 In 1992, Disney released the first sequel, Honey, I Blew Up the Kid, with Moranis, Strassman, O'Neill, and Oliveri reprising their roles as Wayne, Diane, Amy and Nick Szalinski. As the title suggests, Wayne succeeds in enlarging his two-year-old son, Adam, to gigantic proportions as one of his size-changing experiments goes awry. A three-dimensional film called Honey, I Shrunk the Audience complete with physical effects such as wind and water was created as an attraction at Walt Disney World's Epcot in 1994, and later Disneyland, Tokyo Disneyland, and Disneyland Paris. It is a mock award show by "The Imagination Institute" that is intended to honor Wayne as "Inventor of the Year". Instead, the audience is "shrunk" and threatened by Quark, Gigabyte (Nick's pet python), Diane, and even Adam, among other thrills. It reprises most of the original cast and adds Eric Idle as the host of the award show. The attraction closed at all of its Disney Parks locations for Captain EO, which was originally replaced by it in 1994, and brought back after Michael Jackson's death. In 1997, Disney produced the second sequel, Honey, We Shrunk Ourselves, as a direct to video release. Rick Moranis was the only returning actor from the previous films who reprised his role, with Amy and Nick having gone off to college and Quark's disappearance never being explained. Many new characters were added such as Wayne's brother, Gordon, and his family. This time, the parents are shrunk and need to be rescued by their kids. The last incarnation of the franchise was the television program Honey, I Shrunk the Kids: The TV Show. Peter Scolari took over as Wayne and Nick and Amy both returned as characters, roughly the same age as in the original film, and played by new actors. Its plots involved other wacky Szalinski inventions (rarely the shrinking machine) that do not work quite as expected and land the family in some type of humorous mixed-up adventure. In February 2018, The Hollywood Reporter revealed that live-action remakes of several films are in development as exclusive content for Walt Disney Studios' upcoming streaming service; with one of those named in the announcement being this one. ^ a b "Honey, I Shrunk the Kids (1989)". Box Office Mojo. 1989-10-24. Retrieved 2015-10-14. ^ a b c "The Making of 'Honey, I Shrunk the Kids'". 1989. Retrieved 2009-10-17. ^ "The Making of 'Honey, I Shrunk the Kids' Part 3". 1986. Retrieved 2009-10-17. ^ Sometimes referred as "Greg Fonseca". ^ "The Making of 'Honey, I Shrunk the Kids' Part 2". 1986. Retrieved 2009-09-12. ^ "Use of Raymond Scott's "Powerhouse"". Retrieved 2012-11-11. ^ "Disney Planning Another 'Muppets' Reboot for Its Streaming Service (Exclusive)". The Hollywood Reporter. February 21, 2018. Retrieved February 26, 2018. This page was last edited on 12 April 2019, at 18:20 (UTC).